Tim Streeto, ACE is a film and television editor whose recent credits include Netflix’s Maniac, Amazon’s The Marvelous Mrs. Maisel, Director Marc Webb’s The Only Living Boy in New York, HBO's series Vinyl, WeTV's South of Hell, the Emmy-winning Boardwalk Empire, NBC’s Crossbones, and Noah Baumbach's acclaimed feature films Frances Ha, Greenberg, and the Oscar-nominated The Squid and the Whale. His past film credits include Terry Kinney's Diminished Capacity, Steve Conrad's The Promotion, Craig Zobel's Great World of Sound and Robert Pulcini and Shari Springer Berman's American Splendor. He also worked as an assistant editor on Ang Lee's Oscar-winning Crouching Tiger, Hidden Dragon, Todd Solondz's Storytelling, and Steven Soderbergh's "Solaris," among others, and has edited numerous shorts and shows for Comedy Central, A&E, Starz, Nickolodeon, and the History Channel. Click here for more information on our Six Week Intensive or for registration information. 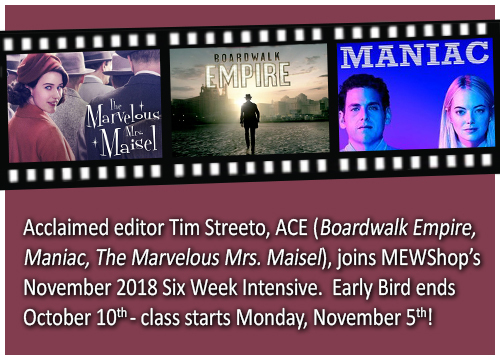 Older PostEmmy Winning Editor Maya Mumma, ACE, joins Our Next Six Week Intensive Starting September 10th!